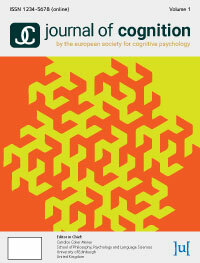 The Journal of Cognition, the official journal of the European Society for Cognitive Psychology, publishes reviews, empirical articles (including registered reports), data reports, stimulus development reports, comments, and methodological notes relevant to all areas of cognitive psychology, including attention, memory, perception, psycholinguistics, and reasoning. We also publish cross-disciplinary research if we judge that it has clear implications for development of cognitive psychological theories. As a signatory of the Center for Open Science's Transparency and Openness Promotion guidelines, we value methodological rigour and transparent scientific practices. We welcome submissions from scholars working anywhere in the world. Journal of Cognition is very happy to announce the launch of volume 2 with three new publications. Accompanying an Editorial from Candice Morey, we have a paper on spoken-word recognition from David Liben-Nowell et al (http://doi.org/10.5334/joc.51) and another on measures and performance on the Antisaccade Eye Movement Task from B. B. Magnusdottir et al (http://doi.org/10.5334/joc.52). Candice Morey, the journal's EiC, has also been speaking to Ubiquity Press, reviewing the reasoning for turning to open access, the first year of publishing, and plans for 2019. Read the Q&A at https://t.co/IhWjErzzRD. The Journal of Cognition is now open for submissions for the inaugural volume. If you wish to submit a paper for our launch, please read our About page and author guidelines to help guide your submission. The journal is keen to reward reviewers and reduce Article Processing Charges (APCs), so is offering reduced APCs for authors who have previously reviewed for the journal as well as ESCoP members. View the publication fees policy for more details. The Journal of Cognition is now open for submissions. For more information about the journal please visit our About pages.